What's the Difference Between a Christian College and a Bible College? Who Should Consider Attending an Online Christian College? What Will I Learn at an Online Christian College? A Christian college refers to any postsecondary, degree-granting institution that integrates biblical teachings and Christian philosophy into the curricula. Many Christian colleges offer concentrations in one particular denomination, such as Jesuit, Presbyterian, or Catholic. Others remain non-denominational. Unlike secular schools, which provide a Christ-centered education to students pursuing degrees in Christianity-related fields, Christian colleges require all students to complete degree requirements related to the school's religious faith. Founded in 1946 in Longview, TX, LeTourneau University began as a technical institute dedicated to trade skill and technology programs. The college maintains its focus on practical, professional education today through a range of online degree programs in aviation and aeronautics, arts and sciences, business and technology, education, and psychology/counseling. The earliest LeTourneau students gained hands-on job experience at the nearby LeTourneau Incorporated factory, and the legacy of applying theory to practice continues through required practicums. Several of LeTourneau’s online programs also offer credits to students who work in a position relevant to their career aspirations. The school can also help online students arrange practicums in their own communities in fields like healthcare, business, and education. As one of the top online Christian colleges in Texas, LeTourneau offers a range of undergraduate and graduate degree programs, including health care administration, criminal justice, and business management. The school also offers programs in aviation studies and aviation management, which prepare students for careers in the air transportation industry, such as airport manager, aviation safety inspector, and professional pilot. Regardless of degree choices, however, students at LeTourneau benefit from a curriculum that integrates Christian faith into course content, class discussions, and professional preparation strategies. This focus helps students make informed academic, professional, and personal decisions rooted in religious values. Online learners receive personalized support from career mentors and academic advisors, who offer help with course selections and registration to career counseling, interview preparation, and personal and spiritual advice. With a campus just outside of Knoxville, TN, Johnson University also maintains extension centers in cities around the country, including Indianapolis, Louisville, Orlando, and Phoenix. The school’s founding dates to 1893, making it the second-oldest bible college in the country. Johnson boasts a long history of distance education, as well, originally offering bible study courses through correspondence. 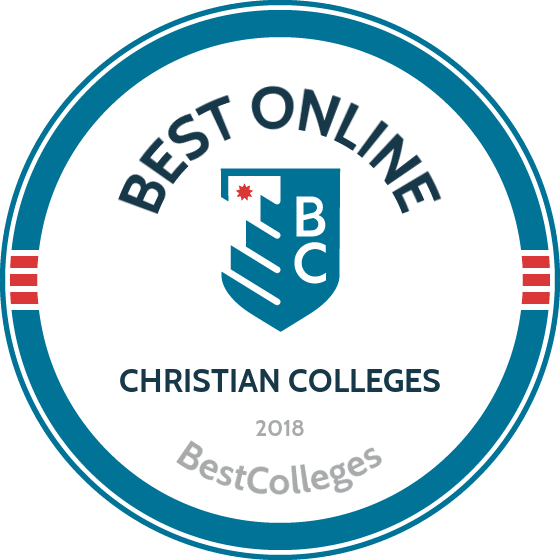 Today the school ranks as one of the oldest Christian online colleges, with several online associate, bachelor’s, master’s, PhD, and certificate programs available. Johnson’s online degrees include several religion-centered programs, such as ministry leadership, pastoral care and counseling, biblical studies, and bible translation. Johnson’s professional degrees are grounded in a biblical context, including nonprofit administration, intercultural studies, and a business administration degree with available concentrations in management, marketing, and sports management. For students looking to combine the convenience of online courses and the interactivity of traditional brick-and-mortar courses, Johnson offers hybrid degrees through its Indianapolis, Louisville, and Knoxville campuses. Many degree programs include hands-on professional practicum experiences, which students can perform at one of Johnson’s church partners around the country. The school can help students arrange practicums through local churches, businesses, and community organizations. The college offers a wide range of support services and resources to online students, including academic coaching, course selections, and other academic advice. Students also have access to dedicated tutoring resources, technology services, the virtual library, and career services. Along with live counseling sessions, online learners have access to a large selection of academic resources related to distance education, including study skills training, time management advice, proofreading and writing help, and test-taking tips. While Liberty’s Lynchburg, VA campus serves around 15,000 residential students, the school boasts an extensive online program that enrolls more than 100,000 students worldwide. Liberty began its distance education program in 1985, and the school has been a pioneer in the field ever since, becoming one of the first Christian colleges to offer totally online degrees. As one of the world's largest online Christian college, Liberty Online prides itself on a vast selection of degree programs that covering fields as diverse as aeronautics, business, criminal justice, and education. Students can pursue online degrees at all levels, from associate and certificates to bachelor’s, master’s, and doctoral programs. Designed with working students in mind, Liberty offers several start dates in the fall, spring, and summer semesters. Blackboard hosts Liberty's virtual learning ecosystem, with an orientation to acclimate students new to distance learning. Many of Liberty’s degrees use an asynchronous format that provides the flexibility to fit classwork and assignments into busy schedules. The school offers online courses in an eight-week semester format that requires no campus visits, though some programs may require on-campus courses or occasional intensive sessions that take place on-campus over the course of a weekend. For students with professional experience relevant to their field of study, Liberty offers several options to earn academic credit from experience, typically via exams or the presentation of a portfolio of professional work. Students may be able to use work experience, military service, prior certificate programs, and even general life experience to qualify for these credits. Skilled professionals can earn up to 30 credits from experience, considerably shortening the time it takes to earn a degree. Found in 1826, Mississippi College is the oldest college in the Magnolia State and the second-oldest Baptist college in the country. With a student body of more than 5,000, MC is the largest private college in Mississippi and one of the largest online Christian universities in the region. The school offers a large selection of online degrees at the undergraduate and graduate levels. Students choose from five bachelor’s degrees, including homeland security and loss prevention. There are more than a dozen master’s degrees available, such as cybersecurity and information assurance, intercollegiate athletic administration, educational leadership, and health informatics. MC also offers an online doctorate in professional counseling, and a range of graduate and post-baccalaureate certificates. Many degrees offer multiple start dates throughout the year, with courses held in eight-week blocks to accommodate working professionals. MC courses offer a mix of asynchronous coursework that students complete on their own schedules, along with synchronous course meetings to allow for live interactions with peers and faculty. To accommodate work schedules, synchronous courses typically meet in the evenings. MC’s tuition is one of the most affordable among private colleges in the country: according to College Board's Trends in College Pricing, the cost of attendance is about the same as most state schools. MC students receive around $53 million in financial aid each year, from academic scholarships and need-based grants to awards specifically for transfer students. As one of the best online Christian colleges in the region, MC boasts many notable alumni in the arts, politics, and sports, including Mississippi Governor Phil Bryant, author Barry Hannah, and NFL player Fred McAfee. IWU is home to more than 15,000 students, and is the largest private college in Indiana and one of the biggest Christian colleges in the country. More than half of all students enroll in online courses, making IWU also one of the largest Christian online colleges in the Midwest. With education centers scattered throughout Kentucky, Ohio and Indiana, the school is an ideal option for distance learners wanting access to a physical campus. IWU boasts over 80 programs at the undergraduate, graduate, and certificate levels, with fully online and hybrid options available. Programs include business, nursing, education, counseling, and criminal justice. All degrees are rooted in a strong liberal arts curriculum that teaches students creative and critical thinking from a Christian perspective. For working professionals looking to finish their degree as quickly as possible, the school offers accelerated courses that combine online learning with weekly intensive campus sessions. Candidates complete each course in eight weeks and graduate in roughly half the time of a normal campus degree. IWU’s online learners receive significant support from the college, including dedicated online advisors and access to off-campus library services. Students receive a personal academic advisor to assist with course and major selections, registration and graduation. Advisors help students communicate with different departments at the school, and identify other important services and resources a student may need. The school’s library includes live research assistance from librarians and other staff, with full online access to substantial collection of periodicals, journals, eBooks, databases, and other materials. IWU also offers spiritual support to students via online forums for digital devotionals and to post prayer concerns. A private liberal arts college rooted in the Lutheran Church - Missouri Synod tradition, Concordia-St. Paul serves around 4,000 students of many faiths and backgrounds. The school is one of the most affordable online Christian colleges in Minnesota, and online students incur no application fees. Additionally, active duty military students receive significant tuition discounts. Concordia offers practical, experienced-based online degrees to prepare students for professional success, and 92% of graduates find jobs in their field of study. Online learners choose from a large selection of associate, bachelor’s, master’s, and doctoral degrees in fields as diverse as radiologic science leadership, exercise science, education, and creative writing. Several degrees are fully online with synchronous and asynchronous courses, though some programs are offered entirely asynchronously and require no scheduled course meetings. Other programs blend online learning with occasional campus meetings. Students take one, three-credit course at a time, and complete each course in seven weeks. This format allows Concordia to offer several degrees in a cohort model, in which students move through a set sequence of courses together. This model facilitates stronger learning communities among students, even while only meeting occasionally. Because of its emphasis on professional education, Concordia maintains partnerships with several major companies and offers accelerated online undergraduate or graduate programs to employees at a reduced cost. Workers at United Airlines, AT&T, 3M, and Unitedhealth Group benefit from flexible online degree programs to improve their companies and their own career prospects. Based in Toccoa, GA, about 90 miles northeast of Atlanta, Toccoa Falls College (TFC) is a small liberal arts college in the Christian and Missionary Alliance denomination. One of the top online accredited Christian colleges in the region, TFC’s small enrollment of around 1,200 undergraduates allows for an intimate student-faculty ratio of 14:1, and online learners receive personalized, one-on-one advising and mentoring. The school offers 10 bachelor’s degrees in religious and secular subjects, ranging from counseling psychology and sports management to biblical studies and ministry leadership. Three associate degrees are available in business administration, general studies, or criminal justice, along with two certificates in biblical studies or cross-cultural studies. TFC is dedicated to Christian service and outreach, and all degree candidates maintain regular public service activities throughout their education. Students serve locally at churches, schools, or other community organizations. Service work encourages students to obey the commandment to serve God and others, and provides real world experience by developing leadership, communication, and teamwork. Associate degree candidates must complete two service experiences, while bachelor’s degree students are required to complete four. The college may assist with placement, should students require help. TFC’s online students receive a comprehensive selection of online resources, such as career counseling, tutoring services, academic advising, and library support. All academic programs boast a dedicated career counselor to aids students with course selection and other academic issues. Online career counselors assist with the selection of majors and courses, but also help build career strengths and develop job skills like resume writing and interviewing. TFC’s Center for Academic Success offers online tutoring in the evenings to accommodate working students. With a main campus near downtown Dallas, TX, Dallas Baptist University (DBU) operates locations in Plano and Hurst and a sizeable distance education program that serves students all around the state. Though it began as the first two-year college in Texas, today DBU offers online degrees at the associate, bachelor’s, and master’s level, along with graduate and undergraduate certificates. The school serves around 5,100 students annually, and DBU’s average class size of 11 students allows for individualized attention from faculty. DBU’s undergraduate programs include health care management, business administration, biblical studies, and many others. Graduate students choose from several advanced religious degrees, such as family ministry, discipleship, and children’s ministry. DBU offers several accelerated bachelor’s/master’s degrees for students willing to take an increased course load. Options include Christian ministry, business administration, and management. The school also offers a large selection of dual master’s degree programs combining two related disciplines, including business administration/children’s ministry, management/student ministry, and business administration/educational leadership. Many programs, particularly graduate degrees, include an internship or practicum component, where students gain professional experience and apply their learning to real issues in their field. Online courses are ideal for working professionals. DBU courses are asynchronous with no required times for course meetings. While there are deadlines to complete assignments, students are never required to log-on at a specific time. The school offers a host of resources for online students, including a 24-hour help line, comprehensive technical support, office assistance, and a writing center to provide help with various assignments at all stages of the writing process. Rooted in the Presbyterian Church and the Evangelical Presbyterian Church, King University has provided religious and professional education since 1867. Today, King serves students at its main campus in Bristol, TN, a distance education program, and several satellite campuses and extension centers around Tennessee and southwest Virginia. Though King is private, the school ranks as one of the most affordable online accredited Christian colleges in the region, and offers a competitive tuition rate and generous financial aid packages. Respected both regionally and nationally, the school boasts several notable alumni in politics, business, and the arts, including children’s author Katherine Paterson, United States Senator William R. Laird, and financial trader and writer Christian H. Cooper. King offers 11 bachelor’s degrees in professional and liberal arts subjects, including majors such as psychology, religious studies, information technology, and history. The school also boasts two online graduate degrees in business administration and nursing, along with an associate of arts degree. Online programs are designed for working professionals to complete their degree as quickly as possible. Courses are available year-round, with multiple start dates per year. King exercises a generous credit transfer policy -- undergraduates are eligible to transfer up 76 credits toward their bachelor’s. Through the school’s agreements with several local community colleges, students may also earn an associate degree while completing degree requirements toward their bachelor’s at King. Accelerated degree programs -- which can be completed in as few as 16 months -- may be another option for working students. Founded in 1911 as a women’s college in the Southern Baptist Convention, Anderson University (AU) is a comprehensive coeducational institution that serves more than 3,400 students. The school’s commitment to a strong liberal arts core prepares students professionally and academically, but AU also emphasizes family, church, and community commitments. As one of the best online Christian colleges in the region, AU has produced several notable alumni, including bestselling author Sue Monk Kidd, Tony Award-winning writer James Lee Barrett, and South Carolina District Judge Timothy M. Cain. The school’s main campus in Anderson, SC sits at the foot of the Blue Ridge Mountains, but AU offers several online degree programs in areas such as business, criminal justice, allied health, education. Undergraduate students select degrees such as homeland security/emergency preparedness, organizational leadership, and behavioral sciences. Graduate students may enter programs in business administration, ministry, or music education. AU also offers an online doctorate program in ministry. Several programs are available in a fully online format, while others use a hybrid model that allows students to mix on-campus and online courses. AU offers several unique services to online learners, including prayer request forums and textbook delivery. The school also matches all online students with a personal Journey Coach, and an academic advisor to help with all stages of the academic process, including applications, transcripts, credit transfer, registration, course selections, and financial aid. Journey Coaches help degree candidates create academic plans that ensure the most effective use of courses and resources, and they’re available to answer any questions that arise throughout the semester. These advisors are trained to help working adults navigate the challenges of returning to school. A private liberal arts college in Lakeland, FL, Southeastern University (SEU) is home to more than 5,800 students and is the largest college in the Pentecostal Assemblies of God. The school is also one of the largest Christian online colleges in the Sunshine State, with its distance education program offering bachelor’s and master’s degrees in behavioral and social sciences, business, criminal justice, ministry, education, and digital media. From organizational leadership and business administration to elementary education and human services, SEU’s degree programs emphasize the intersection of professional ethics, community building, and Christian values, and trains graduates to become effective servant leaders in their fields. Though the school is Pentecostal, SEU accepts students from all Christian denominations. All SEU online learners receive a mandatory orientation acclimating them to virtual education. Most of the school’s undergraduate degrees are completed in roughly four years of full-time study, while graduate programs take 12-24 months to complete, depending on course load. SEU arranges many of its degree programs in a cohort format, and online students move through a sequences of courses together while building deeper academic and professional relationships among peers. Most online courses are asynchronous and allow students to complete work on their own schedule. Many programs, particularly master’s degrees, include a hands-on practicum experience to provide students professional experience in their area of study. While most practicums can be completed locally, some require students to be on-campus or international. For example, students pursuing the master’s program in international community development participate in a week-long international practicum in El Salvador to gain a wider perspective of the field. Founded in 1928 in Fullerton, CA, Hope International University (HIU) is non-denominational online Christian university in the Christian Churches/Churches of Christ tradition. Today the school serves more than 2,000 students on-campus and online from many different Christian denominations. HIU offers five undergraduate degrees online, including an associate of arts, and bachelor’s programs in four areas of liberal studies: teacher preparation, business administration, Christian ministry, and human development. The associate of arts program introduces students to the fundamentals of arts, sciences, and biblical ethics, and graduates transfer seamlessly into any of HIU’s bachelor’s programs. The bachelor’s degree in teacher preparation builds a base of knowledge for future educators, and juniors and seniors may enroll in graduate level education courses, earning up to nine credits that count toward a bachelor’s and a master’s degree. The Christian ministry program prepares graduates for church leadership roles with courses in theology. Students in the business administration program may complete their degree in a unique accelerated format that allows them to finish in just three years, rather than the typical four. The human development degree emphasizes Christian values in the counseling and helping professions, with two concentrations available in either community mental health or family studies. HIU offers several graduate degree programs in education, counseling, business administration, and church music, among others. Some programs -- such as general management and counseling psychology -- are available fully online. Others use a hybrid format that requires students to complete some coursework on-campus in addition to online classes. Degree candidates who are unfamiliar with online learning can sample a free online demo course through the HIU website. The demo provides a general sense of online course structuring and helps students determine their preparedness for online work. Warner is a private liberal arts college based in Lake Wales, Florida and affiliated with the Church of God. Serving around 1,200 students annually through both on-campus and online programs, Warner ranks as one of the top online accredited Christian colleges in the region, with full accreditation status from the Southern Association of Colleges and Schools Commission on Colleges. At the associate degree level, degrees are available in general studies or church ministry. Online learners pursuing a bachelor’s degree choose from programs in business administration, educational studies, healthcare management, and transformational Christian ministry. Graduate students, meanwhile, can choose from programs in business administration, educational studies, management, and ministry. Graduate students complete their program in 16-36 months, while undergraduate degrees take four years. Warner offers a generous credit transfer policy, and students with previous college experience can transfer some credits to complete their degree more quickly. Professionals with relevant training or certifications in their field of study may be able to earn credit from experience. Warner is dedicated to the integration and application of Christian values in public life, and the school offers several grants and tuition discounts for undergraduate or graduate applicants employed in public service industries. Professionals in law enforcement, fire safety, emergency services, civil air patrol, and corrections receive a public service scholarship automatically upon enrollment in any program. Active duty service members and veterans are also eligible for tuition reductions and other benefits. For current ministers, ministry associates, parachurch workers, and lay ministers, Warner offers church service grants to reduce the cost of tuition. Finally, Florida Hospital employees receive a tuition grant upon enrollment. The hospital grant is available to both full- and part-time students, though part-time students receive prorated funding that depends upon course load. As one of eight Christian liberal arts colleges affiliated with the Church of the Nazarene, Northwest Nazarene University (NNU) primarily enrolls students from Colorado, Idaho, Oregon, Montana, Washington, Wyoming, and parts of Nevada and Utah. The college operates a main campus in Nampa, ID, along with satellite programs in Boise, Twin Falls, and Idaho Falls. NNU offers a robust online program, as well, with more than a dozen degrees from the associate to doctoral level. NNU is a major advocate for adult education, and enrolls around 2,000 traditional students and more than 6,000 in continuing education programs. The school is also one of the top online Christian universities in the region, with an esteemed alumni list that includes NASA astronaut Richard Hieb, mystery author Donna Fletcher Crow, and Idaho First Lady Lori Otter. Associate degrees are available in education, Christian studies, and accounting; and bachelor’s degrees are offered in liberal studies, Christian ministry, nursing, and business administration. At the graduate level, students select from pastoral ministry, missional leadership, spiritual formation, and youth and family ministry. NNU also offers graduate degrees in nursing and educational leadership, and a doctoral program in educational leadership with optional concentrations in building administrator and superintendent. Most of NNU’s degrees are available in a fully online, asynchronous format, requiring no visits to campus -- degree candidates complete coursework around their own work and home schedules. Due to the online program’s flexibility, many of NNU’s students are internationally-based, and online learning provides a cross-cultural communication uncommon in most distance education programs. A small private evangelical school aligned with the Christian and Missionary Alliance, Crown College is home to 1,200 students on a campus 30 minutes west of Minneapolis, MN. The Council of Christian Colleges and Universities ranks Crown among the most affordable online Christian colleges in the Midwest, with a tuition rate between 20-40% lower than comparable schools in region. Crown graduates have achieved regional, national, and international success, and the school counts Minnesota state legislator Peggy Bennett and Veggie Tales creators Mike Nawrocki and Phil Vischer among its alumni. Crown offers a range of online undergraduate degrees, including associate degrees in business, Christian ministry, and general studies. Eleven bachelor’s degrees are available, including programs in global and cultural studies, alcohol and drug counseling, and disaster and emergency management. All undergraduate programs require students to take a Christian studies core of 15-21 credits, and cover global and ethical leadership, apologetics and Christian evidences, biblical literature, biblical interpretation, and systematic theology. The curriculum also includes a general education core in the liberal arts and humanities. Crown’s online graduate programs include business administration, Christian studies, counseling, global leadership, ministry leadership, organizational leadership, and the popular Master of Divinity degree. Many of the school’s master’s programs offer a selection of emphases, including pastoral counseling, disaster and emergency management, international Christian education, and church development. Some degree and emphasis options require specific prerequisites: students who concentrate in church development or ministry leadership must have at least 12 undergraduate credits in bible and theological studies, while business administration requires students have at least six undergraduate credits in corporate finance and financial accounting. Based in Winfield, KS, Southwestern College (SC) is a private Methodist school with an enrollment of just 1,900 students. The college’s small size leads to classes of just under 15 students, which allows for personalized attention from faculty, even in online courses. SC offers online degrees through its Professional Studies department, with eight start dates throughout the year to accommodate working students. The school has graduate and undergraduate online programs in fields like business and leadership, education, healthcare, social sciences, ministry, security and safety, and technology. Specialized online certificates for undergrads are available in areas including cybercrime investigation, homeland security, and operational management, while graduate students can pursue certificates in emergency planning, enterprise risk management, and executive leadership. SC’s online courses use a six-week format to provide flexible scheduling. For certain specialized degrees -- including nursing and education -- some courses may be longer than six weeks. All students receive a personal academic success coach who offers academic advice and connects students with campus resources. Coaches assist with course selection, study habits, career goals, and enrollment, and help students identify problem areas and collaborate on solutions. Online students also receive support from the SC Writing Center, where web-based tutoring sessions help students develop their writing and become critical editors of their own work. The Writing Center also offers 24/7 access to the SC Online Resource Center, and includes comprehensive writing resources and links to specialized tutorials. After graduation, students may use the SC Career Center for resources such as networking opportunities, career direction assessments, job research, and resume help. Founded in 1948 and affiliated with the Churches of Christ in Christian Union, Ohio Christian University (OCU) is one of the top online accredited Christian colleges in the Midwest. Over 4,000 students pursue religious and professional education across campuses in Ohio, Georgia, and online. The school’s online program offers associate, bachelor’s, and master’s degrees in several areas, including business, criminal justice, ministry, nursing, psychology and substance abuse counseling. Undergraduate programs include data analytics, information technology, human services, and political science, while OCU offers advanced degrees in either business administration or ministry. OCU also has a dual degree option for students to earn an MBA and master of arts in ministry simultaneously. This program develops ministers to serve as financial leaders for their church, or alternately, business leaders to incorporate Christian principles and ethics into business decision-making. OCU’s online courses employ a cohort format in which students take one course at a time in the same sequence. All courses are offered asynchronously and students can log-in at any time to access course material. While there are set dates for assignment completion, students aren’t required to log on at specific times or participate in live class meetings, which is ideal for working adults who need maximum flexibility. All courses use a fully online format, and students can earn their degree without ever visiting campus. As an incentive to adult students, OCU offers credit for prior learning opportunities for all online programs. Students with relevant experience (such as professional certifications or military experience) receive academic credit and complete their degree faster. With prior learning credits, transfer credits, or the right selection of courses, students can complete their degree in as little as two years. Ottawa University (OU) is an accredited online Christian college with campuses throughout Kansas, Arizona, Wisconsin, and Indiana. The school also offers online programs via three schools: the School of Arts and Sciences, the Angell Snyder School of Business, and the School of Education. OU’s online programs are available at both the bachelor’s and master’s level, and include English, history, human resources, public safety, and addictions counseling. All programs feature coursework fully online and students can complete their entire degree without ever setting foot on an Ottawa campus. While degrees can be earned at home, certain degrees include state licensure or certification pathways that don’t transfer to all U.S. states. OU’s programs in addiction counseling, nursing, elementary education, and secondary education lead to state licensure in Arizona and Kansas, but program curriculum may not meet requirements for other states. Applicants should contact their state licensure authority to determine if OU meets local degree requirements. OU pairs all online degree candidates with a personal student success team, which consists of an enrollment advisor, academic advisor, and financial advisor. The enrollment advisor helps navigate the enrollment process and connects with the other members of the success team. The academic coach is responsible for a student’s academic progress, and assists with everything from course selection to degree planning to career coaching. Finally, the financial advisor offers strategies to pay for tuition and identifies financial aid, grant, and scholarship opportunities. For applicants uncertain about taking online courses, OU offers a free demo to experience the online learning platform. The demo explores all the major features of OU’s Blackboard online platform, including class discussions, assignments, and communications with peers and faculty. Founded in 1858 in Baldwin City, KS, Baker is the oldest college founded in the state. Today the school has grown to more than 3,000 students, with a substantial online program and satellite campuses that serve nontraditional learners in cities across the state. Baker ranks among the top Christian online colleges in the region, and graduates have found success in business, journalism, the arts, and the church. Some of the school’s notable alumni include Panda Express co-founder Andrew Cherng, New York Times bestselling author Candice Millard, and jazz singer Kevin Mahogany. Baker offers online degree programs at the graduate and undergraduate level in liberal arts, education, sports management, and healthcare administration, among many others. The school organizes courses into 6-8 week modules, which keeps scheduling flexible and allows students finish their degrees more quickly. For students unfamiliar with academic writing, Baker offers several writing resources, including online tutorials, quizzes, guides, and curriculum rubrics that outline professors’ expectations of student writing. One-on-one tutoring through the Baker student portal is also available, where writers submit assignments for feedback or ask questions about academic writing. Students receive asynchronous, personalized, and flexible tutoring through the student portal, as well. The college provides full access to library services, including full-text databases, academic journals, eBooks, and a range of other study materials. Newly enrolled students take advantage of an online library tutorial that outlines the major resources available. Librarians also offer individualized assistance with research and other library functions. Concordia University-Wisconsin (CUW) has provided a Lutheran liberal arts education to students for more than 125 years. Based in Mequon, WI, the school also operates programs in partnership with Concordia Ann Arbor in Michigan. CUW offers associate, bachelor’s, master’s, and doctoral degrees in their online programs, with many in healthcare and human services. Available programs include occupational therapy, family nurse practitioner, healthcare management, education, theology, and business. At the graduate level, CUW’s MBA program features several concentration options in which degree candidates can specialize in fields such as accounting, environmental studies, nonprofit management, and sport and entertainment business. Students with an associate degree and currently employed in the healthcare field can take advantage of the school’s bachelor’s degree completion programs in nursing, diagnostic medical sonography, and radiologic technology. Students may transfer up to 90 credits toward their bachelor’s, and a degree can be completed in as little as a year and a half. CUW provides personal, academic, and spiritual support to each student. As a result, each online student receives a support specialist to help navigate CUW’s distance education platform, make effective course selections, keep track of important dates and deadlines, and stay informed about scholarships and other financial aid opportunities. They also help students maintain a balance between school and personal obligations. Before and after graduation, online learners also receive support from CUW’s Department of Career Services. Career counselors help students (via Skype) develop resumes and cover letters, conduct mock interviews, and connect them to alumni groups and other professionals for networking opportunities. Gardner-Webb University, a Baptist institution founded in 1905, is located about 50 miles west of Charlotte, NC. The school serves more than 4,000 students annually on-campus, and through its continuing education and online programs. The GWU population represents 40 U.S. states and 15 different countries. GWU offers undergraduate degree completion programs in accounting, Christian ministry, criminal justice, entrepreneurship, computer information systems, and nursing. These programs require students to hold at least 48 transferable credits from an accredited institution, which are applied toward a bachelor’s degree. The school maintains partnerships with several North Carolina community colleges, which allows associate degree holders from participating institutions to transfer seamlessly into GWU’s online programs. While eight degree programs are available entirely online, all include optional campus components for students interested in some in-person courses. Several more degrees can be completed in a blended format, which mixes online courses with some required campus courses or class sessions. Completion programs are available at the bachelor’s level only, and no four-year degrees are available entirely online. GWU offers graduate programs in business, English, education, nursing, and sports education, along with graduate certificates in nursing administration, nursing education, and school administration. An MBA with certification is also available for graduates who wish to teach college business courses upon completion of their degree. All graduate degrees are available fully online courses, though business students may take some courses on campus. The nursing and education degrees also require candidates to complete professional internships or practicum experiences in their own community. Online learners build professional experience through these courses, while also blending theory with practice. Founded in 1864, Concordia University-Chicago (CUC) is a private Lutheran college with an annual enrollment of around 5,200 students. The Chronicle of Higher Education has ranked the school as one of the fastest-growing master’s degree institutions, and CUC’s online learning platform is a major part of that growth. More than 40% of graduate students opt for an online degree, while an array of programs from the undergraduate to doctoral level can be completed fully online. CUC’s bachelor’s degrees are accelerated completion programs, and require students to transfer at least 30 credit hours from an accredited community college or other institution. The college accepts up to 67 transfer credits, which may allow students to complete their degree in two years or less. Entrants to the bachelor’s program can earn up to 32 credits for prior learning activities such as professional workshops, training seminars, military service, or other relevant work experience. Applicants must provide documentation of college-level learning, which CUC evaluates and translates into academic credit. Two dozen graduate degree programs are available, including applied exercise science, gerontology, granting writing, sports leadership, and gender studies. CUC also offers an expansive MBA program with 10 concentration options, like digital marketing, finance, accounting, sports management. Online learners complete most graduate programs in 24 months or less, and many include the option to take campus courses. For advanced students, CUC offers 13 doctoral programs, such as educational leadership, gerontology, business administration, and organizational leadership. Most Ph.D. programs take three years to complete, though students may be able to finish faster depending on course load and previously earned credits. While all degrees are available fully online, many of CUC’s master’s and doctoral programs include practicum experiences that students must complete at professional organizations in their community. As a member of the Southern Baptist Convention, North Greenville University (NGU) occupies a small rural campus just outside of Greenville, NC. The school ranks among the top Christian online colleges in the region and offers six bachelor’s degrees online: business administration, Christian ministries, criminal justice, elementary education studies, general studies, and psychology. Designed for students over age 22, these are flexible, self-directed programs to accommodate working professionals. While all coursework is available fully online, NGU emphasizes hands-on learning experiences. Each degree includes an internship or practicum in a professional setting where students draw connections between program learning and actual practice. These take place within local communities, and students gain experience without having to travel. For example, ministry majors perform service at their churches, while elementary education students intern at local public schools. Each program includes 30 credits of core courses in biblical studies and general education requirements, and include composition, history, literature, and sciences. NGU arranges courses in an eight-week format, which allows students to earn credits quickly and take time off as their schedules necessitate. NGU strives for a student-centered learning experience and provides a wealth of resources to support online learners. In-depth tutorials are available for the Blackboard online platform, with videos that explain all major aspects of the system. The library offers a wide selection of research materials and other resources, and online academic advisors coach degree candidates on every aspect of their education. Additionally, students have access to online chapel streams to include them in community events and prayer services. A Southern Baptist liberal arts college based in Riverside, CA, California Baptist University (CBU) serves more than 9,000 students. Its online program is geared toward working adults, and every facet is designed to offer maximum flexibility and convenience. Courses start every eight weeks and take place year-round, which gives students the ability to learn at their leisure and complete a degree at their own pace. CBU also offers flexible courses, and degree candidates may complete their degree fully online or through a hybrid style that includes some evening on-campus courses. The school maintains several convenient educational service centers in Brea, Rancho Cucamonga, Riverside and Temecula. Online learners receive also benefit from access to the career center, virtual tutoring, dedicated personal enrollment counselors, and student service advisors who offer live online academic advising. CBU offers one of the broadest catalogs of online majors. Delivered via Blackboard, available degrees include logistics and operations management, graphic design, communication studies, and kinesiology. Many of CBU’s bachelor’s degrees are completion programs, in which students transfer credit from an associate degree or previously completed undergraduate coursework and apply it toward their bachelor’s. Students in this track can complete their degrees faster than traditional undergraduate programs. The school offers a generous credit transfer policy, and students can transfer up to 100 credits toward their undergraduate degree. At all degree levels, online learners in CBU’s accelerated curriculum typically graduate in about half the time compared to other colleges. Master’s degree candidates, for example, usually complete their degree in one year, compared to two or more years at other colleges. Based in McPherson, KS, Central Christian College of Kansas (CCCK) is an evangelical institution in the Free Methodist Church. The school’s online program offers an associate of arts and an associate of arts in criminal justice, along with bachelor’s programs in healthcare administration, business organizational leadership, psychology, business administration, criminal justice, and ministry leadership. CCCK’s tuition is cheaper than many comparable online Christian colleges, and the school includes all textbooks in the cost of tuition, which allows students to save even further. Online programs also maintain a flat tuition rate per credit hour, so costs never fluctuate between different courses or programs. Students also receive personal support from a dedicated Student Success Advisor, who offers help from enrollment to graduation, and even post-graduation. Advisors connect students with campus resources, help devise study and degree plans, highlight additional education and networking opportunities, and assist with job preparation. All bachelor’s programs include a 36 credit core, where students are grounded in the liberal arts, critical thinking, and communication skills. The CCCK curriculum also includes 12 credits in Christian worldview courses, 18 credits in general electives, and the remaining 54 credits dedicated to courses in the student’s major. All programs are fully online and asynchronous, which lets students complete work on their own schedule without needing to log-on for designated class meetings. The school offers several start dates throughout the year, and most courses are just six weeks long. CBU offers a flexible credit transfer policy, and admission requires just a high school diploma or GED and a 2.0 GPA. Many people use the terms Christian college and Bible college interchangeably, but these institutions remain distinct from one another. Also known as seminaries, Bible colleges prepare students for careers in Christian ministry, divinity, or theology. These professional roles include pastors, reverends, and other church leaders, as well as youth leaders and missionaries. Bible college curricula remains rooted in Old and New Testament doctrine, biblical languages, and vocational training. Students receive little to no liberal arts coursework. Many Bible colleges are not accredited, and academic programs remain limited to undergraduate degrees. Denominational Bible colleges often vary in terms of instructional tone depending on the school's specific Christian faith. Some identify as liberal or charismatic, while others take an evangelical or fundamentalist approach. Bible colleges may restrict or prohibit certain on-campus activities, such as drinking and male-and-female co-mingling at night. In contrast, Christian colleges provide degree tracks that integrate Christian faith and liberal arts studies. They typically offer undergraduate and graduate programs, and usually receive regional, national, or programmatic accreditation. Unlike their Bible college counterparts who seek an exclusively Christian education, Christian college students generally seek a standard educational pathway that includes elements of Christianity, such as theology and religious philosophy. Students enjoy a less-strict campus culture at the best Christian colleges, though many require students to sign commitment forms pledging to refrain from certain behaviors while they are enrolled. The ideal student enrolled at a Christian college possesses a Christian background and demonstrates an interest in math, science, and liberal arts coursework. Students typically desire degrees that will enable them to work in fields outside theology and Christian ministry. Some are lifelong Christians, while others choose to attend a Christian college after reconnecting with their faith. However, even the best Christian colleges are not for everyone. Students who aspire toward careers in theology, divinity, or ministry should consider Bible colleges because their curricula focuses more heavily on these fields. Students who prefer a more restricted campus and less exposure to non-Christian coursework should also consider Bible colleges. DO YOU HAVE TO BE CHRISTIAN TO ATTEND A CHRISTIAN UNIVERSITY? In most cases, students do not need to be Christians to attend one of the best Christian colleges or universities. In fact, many Christian institutions encourage non-Christians to apply because they value campus diversity and open student dialogue between individuals of different faiths. However, note that all students at a given Christian institution must complete the same amount of faith-related coursework, regardless of their religious background. Additionally, institutions with stricter admissions guidelines reserve the right to turn down non-Christian applicants. Prospective non-Christian students should contact admissions officers at all Christian schools they are interested in attending to learn more about requirements. Students should also investigate curfews, campus dress codes, and other rules that may set these institutions apart from secular colleges and universities. The requirements of a Christian degree vary by school. Generally speaking, these institutions offer programs that integrate biblical teachings and Christian philosophy into an otherwise secular curriculum. The next section provides an in-depth look at what students should expect while attending a Christian college. Christian colleges and universities vary in terms of course selection, but many Christian colleges offer the same areas of study, such as the courses listed below. This course delves into early biblical history, beginning with the creation of the world as laid out in the Book of Genesis. Students learn how Old Testament doctrine has influenced laws and ethics throughout the world, as well as key differences between these 46 books and the Christ-centered New Testament. Beginning with the birth of Jesus Christ, the New Testament chronicles the life and death of Jesus, followed by the creation of the modern Christian church. Students examine similarities and differences between the strict Christian laws of the Old Testament and the newer, more progressive message of the New Testament. Theology is defined as the study of God and religious beliefs. In a Christian context, theology examines the philosophy behind different biblical teachings, as well as the evolution of the Christian faith over time. Introduction to theology courses equip students with foundational knowledge and skills needed for more advanced theology studies. This course explores the fundamental differences and similarities between Christianity, Islam, Judaism, Hinduism, and other major world faiths. Focus areas include scriptural comparisons, monotheism vs. polytheism analyses, practices among devout followers, and world regions where different religions are most predominant. Persuasion refers to the various factors that contribute to the development of different religious beliefs, philosophical ideas, attitudes, and behaviors. Students learn how persuasion and reason effectively shape modern Christianity and its various denominations, as well as theological arguments and religious propaganda. Is the Curriculum Different at Online and On-Campus Christian Colleges? Online and on-campus programs offer similar curricula even though the learning formats differ. Working professionals and students with family commitments often prefer online programs. The asynchronous coursework in online programs allows students to complete assignments and watch online lectures when their schedule allows. Conversely, traditional classes require students to attend school on campus, where they enjoy face-to-face interaction with fellow students and faculty. Both online and on-campus classes at Christian colleges require students to take religion classes. Regardless of a student's major, Christian colleges require students to complete classes on topics such as biblical literature or New Testament. The specific type of required religion course depends on the college. Additionally, the number of required credits also varies. Some colleges require students to take up to three religion courses. At a minimum, students should expect to take one religion course to graduate from an associate or bachelor's program. Do Christian Colleges Teach Modern Science Theories? Modern science remains a hot topic among religious scholars and students. Historically, many Christian colleges and universities have shied away from teaching certain topics of modern science, such as biological evolution. However, current accreditation standards demand that Christian colleges and universities must offer courses rooted in modern science in order to earn official accreditation, as well as recognition from organizations such as the Council for Christian Colleges and Universities (CCCU). According to CCCU, all member schools must offer comprehensive undergraduate curricula rooted in the arts and sciences. Students should carefully review the curricular standards of each Christian college and university they are considering. If a school has earned regional, national, or programmatic accreditation from a recognized accreditation provider, that institution offers courses rooted in modern science. If a school has not received accreditation or is accredited by an agency that hasn't been recognized by the U.S. Department of Education (ED) or Council for Higher Education Accreditation (CHEA), then the student should assume that the institution does not offer many courses that focus on modern science. An online program at a Christian college or university represents significant financial and time investments for any student. Individuals must carefully vet each school on their list of potential degree providers. This section examines some factors that should affect a student's decision. Major and Program Choice: Different colleges offer different programs and majors. Curriculum and requirements also vary. Before committing to a school, students should consider if their interests match the courses offered within a program. Also, students should research how the major prepares them to accomplish their career goals. Location: A college's location impacts a student's overall experience and what they pay. Commuters must account for the additional time and transportation costs they incur traveling to school. Also, if you choose an out-of-state college, expect additional tuition costs. Cost: The total cost of college, including tuition, fees, and other college-related expenses, depends on several factors. Private colleges almost always cost more than public schools. Also, part-time students pay more than full-time students. If you're concerned about cost, consider online classes, which often cost less than on-campus classes. Views and Practices: Being around like-minded people makes college more rewarding. To maximize your college experience, ensure that your views align with the school's views and practices. This matters because the faculty and students likely share these same beliefs. And as a student, you will spend years learning in this environment. Online programs at Christian colleges typically integrate biblical teachings and Christian philosophy into the curricula to the same degree as brick-and-mortar programs. At many schools, online and on-campus degree pathways share the same curriculum and faith-based coursework requirements. Additionally, online professors and faculty members must sign the same commitment to faith forms as on-campus personnel. Many Christian colleges employ faculty members who divide their time between distance learners and on-campus students. A growing number of online Christian programs use technology that allows students to connect with one another and plan face-to-face meetings. Many on-campus Christian college programs require students to attend church at least once per week. Online programs may hold the same attendance requirements, but in some cases, distance learners don't need to attend church regularly. Online programs often include capstone experiences related to Christian ministry and faith-based service. Students must seek approval from school faculty members and coordinate service projects with churches, shelters, and community centers. Accreditation refers to the standardized vetting procedure that all degree-granting institutions must undergo in order to be officially recognized as educational providers. To receive accreditation, a school must be evaluated on the basis of its academic programs, faculty members, campus resources, and student outcomes. This process can take up to a year. In the U.S., three types of accreditation exist. The first is regional accreditation, which is normally reserved for academic institutions with liberal arts and science programs. Six different regional accreditation agencies evaluate schools in different areas of the country. The second type of accreditation is national accreditation, which is typically awarded to technical colleges, vocational schools, and for-profit institutions. Ten national accreditors have earned recognition from the ED. Although similar by design, regional accreditors adhere to a stricter set of standards than national accreditors. For this reason, many educational experts argue that schools with regional accreditation are academically superior to those that have been nationally accredited. The third type of accreditation, programmatic accreditation, is reserved for subdivisions of colleges and universities that are devoted to one area of academic study. These include nursing colleges, teacher's colleges, and business schools. In most cases, programmatic accreditation applies to graduate-level programs, although some specialized associate and bachelor's pathways may also receive programmatic accreditation. According to the CHEA, three recognized accreditors can evaluate Christian schools: the Association for Biblical Higher Education (ABHE) Commission on Accreditation, the Commission on Accrediting of the Association of Theological Schools (ATS), and the Transnational Association of Christian Colleges and Schools (TRACS) Accreditation Commission. CHEA also recognizes the Association of Advanced Rabbinical and Talmudic (AARTS) Accreditation Commission, which evaluates schools rooted in the Jewish faith. Christian institutions may also be recognized by organizations such as the CCCU, which do not award accreditation but instead award membership to schools based on their academic merits. In the U.S., accreditation-granting agencies are recognized by two overarching bodies: the ED, which is a subdivision of the federal government, and CHEA, which is a nongovernmental organization. Neither organization awards accreditation on its own. Rather, each organization monitors and evaluates the organizations responsible for providing accreditation. For more information, view the full lists of recognized accreditation-granting agencies maintained by the ED and the CHEA. Many students at Christian colleges participate in mission trips or gap years while enrolled in online programs. Some institutions require students to complete some sort of intensive ministry project, often in a rural area or overseas. Even when not required, the vast majority of Christian colleges regularly offer these opportunities to students. A mission trip is defined as a short-term ministry project. Most last between one week and two months. Some mission trips are entirely grounded in person-to-person ministry, including youth-oriented programs. Others integrate additional work, such as housing construction, ESL training, or medical training. Many Christian colleges allow students to pay for all-inclusive mission trips, which include transportation, housing, and a meal stipend in exchange for a flat-rate price. Gap-year programs typically span 9-12 months. These projects almost always take place in another country, and involve a range of programs and activities for local community members. Because of the long time commitment, many gap years include regular coursework requirements for students to complete while they are living overseas. Some schools coordinate gap years for students, but in some cases students must arrange their housing and transportation. Mission trips and gap years provide many benefits to students. They expose young men and women to everyday living and working conditions in another country, allowing students to intimately experience a different culture. Service projects also boost the student's career standing, particularly if they plan to pursue jobs in ministry or theology. Professional organizations provide a career gateway for college graduates. Membership often includes invitations to conferences and networking events; certification and continuing education opportunities; access to online journals and newsletters; and career counseling. Additionally, many professional organizations offer reduced membership rates for current students and recent graduates. Below are some of the top professional organizations for Christian college degree-holders. Associations for Christians in Student Development: Founded in 1979, the ACSD was formed by the union of two separate bodies: the Christian Association of Deans of Women and the Associate of Christian Deans and Advisors of Men. Operating as a gender-neutral organization, the ACSD hosts a national conference each year, offers a comprehensive online job board, and rewards members with unlimited access to academic journal articles and relevant data surveys. Association of Christian Schools International: The ACSI works with teachers, administrators, and other school personnel to integrate Christian education through specialized tools, technology, and professional development. Members can take advantage of services for all grade levels, including international schools. The ACSI website offers a compendium of information about law and advocacy, continuing education opportunities, and networking events, as well as a full list of educational services and programs. Fellowship of Christian Athletes: The FCA represents Christ-centered athletes in 47 countries across the globe. The fellowship offers camps for athletes of all ages, as well as huddles or small-group Bible study programs aimed at coaches and athletes. FCA also provides international travel and fellowship opportunities for members. Despite the relative affordability of online programs, the need for financial aid is still a reality for most students. But rest assured, loans aren't your only option. Explore our collection of financial aid resources or dig into one of the following guides to read more about financing your education. Approximately two-thirds of today's college students rely on loans to fund their education, but students can explore many financing options to reduce their overall debt. Completing the Free Application for Federal Student Aid (FAFSA) remains a crucial first step for any student with financial need. Our FAFSA guide features a step-by-step rundown on the process and answers to several frequently asked questions. Financial aid for online learning is equivalent to what you'll find for campus-based learning, but that hasn't always been the case. Learn about recent changes and funding opportunities for online students. Online college programs offer a flexible, affordable option for single parents who are interested in earning a degree and securing their family's financial future. We've compiled a list of scholarships, grants, and other financial aid options geared toward single moms and dads. Millions of dollars in free money exists for U.S. military personnel, but much of it goes unused. Learn more about grants, scholarships, and other financial aid opportunities available to veterans, active-duty service members, and reservists. Christian students can explore hundreds of financial aid opportunities. This final section explores some of the top scholarships, grants, and other awards aimed at students of faith. Each entry includes the estimated scholarship amount, eligibility criteria, deadlines, and other important details. Who Can Apply: This award (named for a woman who passed away from cystic fibrosis at age 25) is awarded to high school graduates or graduating seniors from Lexington County, South Carolina, with a background in Christian faith and community service. A minimum 3.0 GPA is also required. The rolling deadline for this scholarship is April 1.
Who Can Apply: Each year, hundreds of undergraduate students receive financial support through this scholarship program. Applicants must be entering their first year as associate or bachelor's degree students, and attendance at a Houston-based school is also required. Candidates must also commit to Sunday church attendance. The rolling deadline for this award is July 15. Amount: $9,900 per recipient; applications will be closed as soon as 350 recipients have been selected. Who Can Apply: Established in 1992, this scholarship award is geared toward students who are planning to serve as U.S. military chaplains. Applicants must be members of the United Church of Christ (UCC), Christian Church Disciples of Christ (DOC), United Methodist, or Presbyterian faith. Additional requirements include enrollment in a Chaplain Candidate program and a cumulative B average. The rolling deadline is March 1.
Who Can Apply: These awards from CFL are aimed at elementary, high school, and college students with a background in the Catholic faith. A service project will be required for the latter two applicant groups. The rolling deadline is March 31; applications become available in the fall of each academic year. Amount: $200 for elementary scholarships; $500 for high school scholarships; $1,000 and $500 for college scholarships. Who Can Apply: The awards offered through the Claire Booth Luce Program are aimed at female undergraduate and graduate students. Awards are reserved for students attending select Catholic universities; those attending schools with strong science, technology, engineering, and mathematics (STEM) programs are encouraged to apply. Scholarships and research grants are both available; the rolling deadline is March 14. Amount: Varies by year and selected award. Who Can Apply: First awarded in 2010, this scholarship award is reserved for female high school seniors from the state of Texas. Two to three scholarship recipients are selected each year. The rolling deadline for this award is April 20; applications are available in the fall. Who Can Apply: This award is reserved for students who are attending four-year undergraduate degree programs at accredited liberal arts colleges and universities. Applicants should have a background in the Church of Christ. The rolling deadline is April 12.
Who Can Apply: This fellowship award is open to African-American students who have completed the coursework phase of a doctoral degree program in religion, theology, or biblical studies. Those who are in the dissertation stage, or set to complete their coursework soon, may also apply. The rolling deadline is February 1.
Who Can Apply: This fellowship award is reserved for doctoral students of Latino or Latina, Asian, or First Nations heritage that will have completed coursework in a doctoral religion, theology, or biblical studies program by the time their fellowship goes into effect. The rolling deadline is February 1.
Who Can Apply: Applicants for this renewable endowment award must be in good standing at a United Church of Christ (UCC) congregation, enrolled in a theological education program, and planning to become the pastor of a UCC church. A cumulative GPA of 3.0 or higher is also required, and applicants must demonstrate financial need in order to be considered. The rolling deadline is March 1.
Who Can Apply: Since 1964, more than 6,000 high school seniors have received a total of $2 million in scholarship funding from the ICF. Applicants must either be attending public or Catholic schools in the states of Arizona, California, Illinois, or Indiana. A 3.2 cumulative GPA is also required; other applicant criteria include demonstrated financial need, extracurricular and volunteer activities, and family membership and involvement in the IFL. The rolling deadline is April 12. Amount: $400 to $1,000 (varies by recipient). Who Can Apply: This award is open to female applicants attending more than 200 accredited colleges and universities in the following states: Alabama, Florida, Georgia, Louisiana, Mississippi, North Carolina, South Carolina, Tennessee and Virginia. This is a need-based scholarship aimed at Christian female students. The rolling deadline changes on an annual basis. Who Can Apply: This award is open to female graduate students with a background in the Presbyterian church that are pursuing master's degrees in divinity and seeking a career as ordained pastors. The scholarship is reserved for students attending one of the following: Presbyterian Church seminary; Gordon-Conwell Theological seminary; or Fuller Theological Seminary. The rolling deadline is March 1.
Who Can Apply: This award is aimed at undergraduate and graduate students with plans to enter careers in ordained ministry. Applicants must be U.S. citizens who hail from the Texas panhandle, and are full-time degree-seeking students with a cumulative GPA of 2.75 or higher. The rolling deadline is January 29.
Who Can Apply: Named for the former president of Women's Missionary Union (WMU) of Texas, this award is granted to students belonging to ethnic or racial minority groups that are pursuing a Christian education. This is a renewable scholarship; the amount will depend on whether the recipient is enrolled full- or part-time. The rolling deadline is April 15. Amount: $800 per semester of $1,600 per year for full-time students; $400 per semester or $800 per year for part-time students. Who Can Apply: This undergraduate award is reserved for Presbyterian high school seniors who will be entering a college degree program at a Presbyterian university during the fall term immediately after their graduation. A 2.5 cumulative GPA is also required. The rolling deadline for this award is March 1. Amount: Up to $2,000 per recipient. Who Can Apply: This renewable award is open to both full- and part-time seminarians who are African-American, members of a United Church of Christ (UCC) congregation and in their second or third year of a seminary program accredited by the Association of Theological Schools (ATS). A track record in activism, service, and social advocacy is also required. The rolling deadline is March 1.
Who Can Apply: This award is open to college juniors, seniors, or graduate students pursuing degrees in Christian music ministry. Applicants must be dedicated music majors focusing on choral performance, and enrolled full-time in their degree program. The rolling deadline is February 1.
Who Can Apply: This scholarship is open to undergraduate students that are members of an African Methodist Episcopal church; preference will be given to those who attend an Allen Chapel African Methodist Episcopal Church. Applicants should also have an extensive volunteer and public service background. Half of this non-renewable scholarship will be distributed during the fall term, and the remainder will be issued in the spring. The rolling deadline is May 1.
Who Can Apply: This renewable award (offered through the United Church of Christ) is reserved for graduate-level students pursuing degrees in divinity and planning to become ordained church leaders. Applicants must be 'open about their sexual orientation or gender identity', and must also be UCC members for at least one year prior to submitting their application. A cumulative GPA of 3.0 or higher is also required. The rolling deadline is March 1.